The liquid water path (LWP) is the strongest control on cloud albedo, such that a small change in LWP can have a large radiative impact. By changing the droplet number concentration (Nd) aerosols may be able to change the LWP, but the sign and magnitude of the effect is unclear. 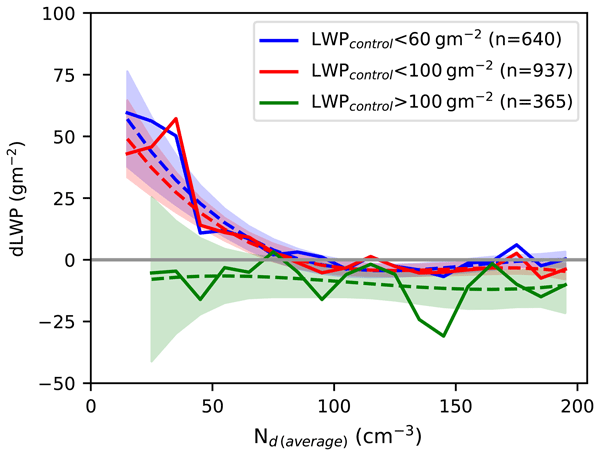 This work uses satellite data to investigate the relationship between Nd and LWP at a global scale and in response to large aerosol perturbations, suggesting that a strong decrease in LWP at high Nd may be overestimated. David P. Duda, Sarah T. Bedka, Patrick Minnis, Douglas Spangenberg, Konstantin Khlopenkov, Thad Chee, and William L. Smith Jr.
We use one year (2012) of satellite imagery obtained from two NASA research satellites, Terra and Aqua, to detect linear contrail coverage and to estimate their physical properties over the Northern Hemisphere. The satellite-derived properties are compared with results collected from the same sensors in 2006 to estimate whether the impact of contrail coverage on climate has changed. The study is the first of its kind to measure contrail properties over a near-global scale from satellite imagery. We present for the first time dual effect of GDI vehicle exhaust on α-pinene SOA mass yield suppression. The first effect is well-known NOx effect, but the second effect is more complex. Our results imply that this second effect is related to change of reaction pathways of α-pinene in the presence of GDI exhaust. Overall, the presence of vehicle exhaust caused more than 50 % suppression in α-pinene SOA mass yield compared to the α-pinene SOA mass yield measured in the absence of GDI emissions. Ozone pollution is increasing in China and the underlying reason is unknown, making effective control unrealistic. 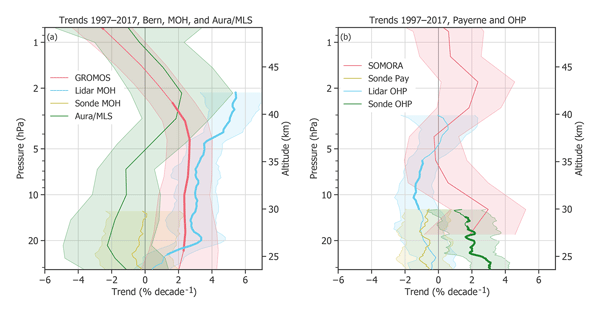 With an innovative approach, we quantitatively identified the impact of meteorology and precursor emission changes on the long-term ozone trend in the PRD. We also concluded that the undesirable NOx / VOC control ratio within the over the past years is most likely responsible for the ozone increase in the PRD. Sectoral contributions of anthropogenic emissions in Denmark, Finland, Norway and Sweden, on air pollution levels and the associated mortality and costs over the Nordic and the Arctic region are calculated. Results showed that more than 80 % of PM2.5 concentrations in the considered four Nordic countries were transported from outside Scandinavia and that residential combustion, together with industry and traffic, are be the main sectors to be targeted in emission mitigation strategies. 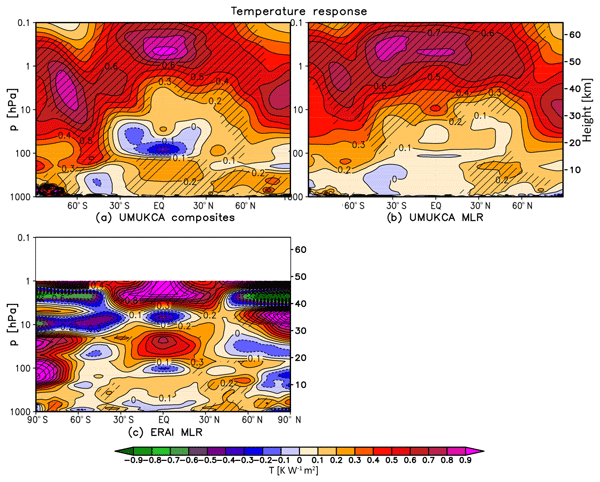 Following model improvements, the atmospheric response to the 11-year solar cycle forcing simulated in the UM-UKCA chemistry–climate model is discussed for the first time. In contrast to most previous studies in the literature, we compare the results diagnosed using both a composite and a MLR methodology, and we show that apparently different signals can be diagnosed in the troposphere. 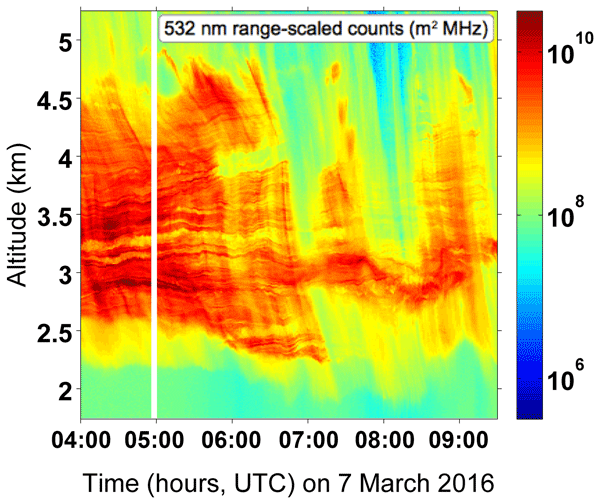 In addition, we look at the role of internal atmospheric variability for the detection of the solar response. This research quantified particulate species that could be used to trace non-exhaust and exhaust traffic emissions. Results showed the important contribution of heavy metals from brake wear to total particulate traffic emissions. 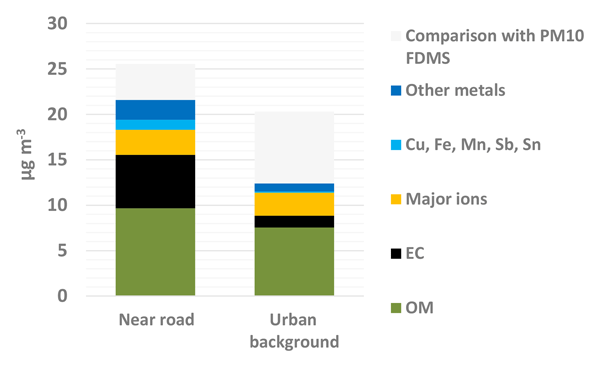 In France the traffic largely dominated by diesel vehicles led to important emissions of elemental carbon, as well as significant emissions of low-molecular-weight polycyclic aromatic compounds. Organic nitrates are important atmospheric species, as their fate could affect nitrogen cycle, ozone production, and secondary organic aerosols; few related studies focus on the regions with high anthropogenic pollution. 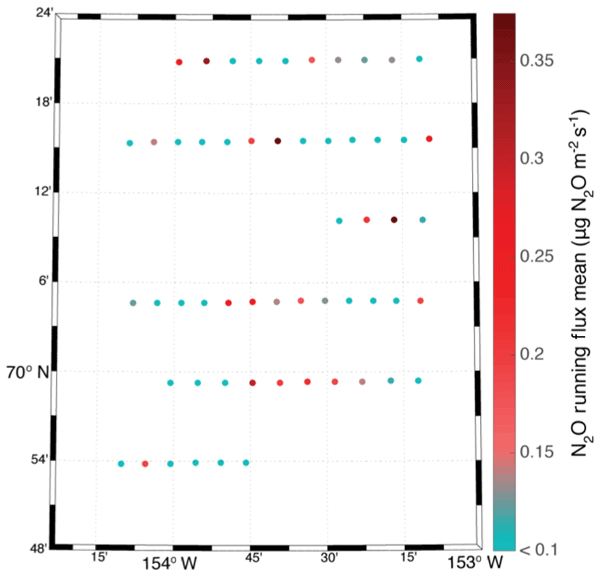 In this study, we find that organic nitrates contribute a notable fraction of organic aerosol during warm seasons, and nighttime particulate organic nitrate formation is highly relevant not only to biogenic VOCs but also to anthropogenic VOCs for urban air pollution in China. The paper presents a modified method to invert mixing ratios of chemically active tracers into stratospheric age spectra. It features an imposed seasonal cycle to include transport seasonality into the spectra. An idealized set of tracers from a model is used as proof of concept and results are in good agreement with the model reference, except for the lowermost stratosphere. Applicability is studied with focus on number of tracers and error tolerance, providing a starting point for future work. Twelve years of radar observations from a mid-latitude location in Kühlungsborn, Germany have been analysed to study characteristics of mesospheric summer echoes (MSEs). The statistical analysis shows that MSEs have a strong daytime preference and early summer seasonal preference. It is demonstrated that the meridional wind transport from polar regions is the important controlling factor for MSEs, while no clear connection to geomagnetic and solar activity is found. Meteor radars are used to track and estimate the fading time of meteor trails. In this investigation, it is observed that the diffusion time estimated from such trail fading time is anomalously higher during noctilucent clouds (NLC) than that in its absence. 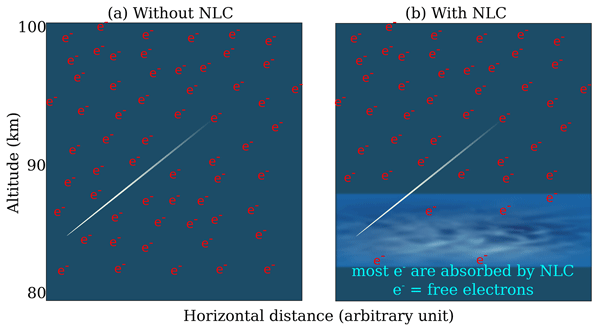 We propose that NLC particles absorb background electrons and thus modify the background electrodynamics, leading to such an anomaly. 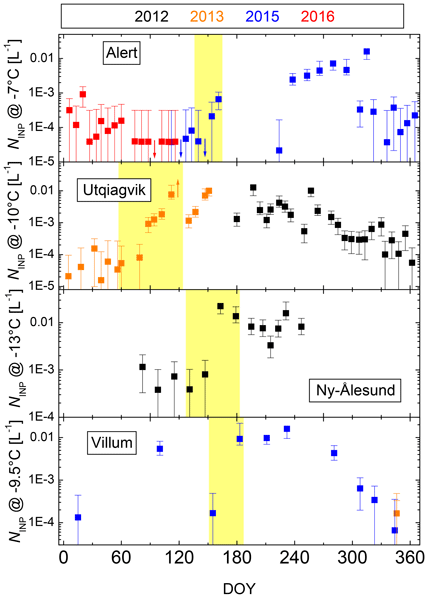 We found an annual cycle for ice-nucleating particles in the Arctic. These particles are important for Arctic clouds, as they can change the lifetime of clouds. We suggest that higher concentrations of these particles in summertime originate from the Arctic biosphere (both marine and terrestrial). With a warming Arctic, these concentrations may increase further, influencing aerosol–cloud interactions and therewith the observed strong warming of the Arctic. Bioaerosols have been an important topic in atmospheric science in the last two decades. This paper compares different emission parametrizations used in fungal spores modeling and compare their results to two sets of new observational datasets. It emphasises their uncertainties in order to improve their modeling in the future. This comparison is addressed primarily to the scientific community (publishing in ACP) interested in this type of modeling and the related experimental work in this field. In this work we evaluate the contribution of the major anthropogenic emission sources to global air quality and human health, focusing on particulate matter (PM) concentrations because of their importance in populated areas and the proven cumulative negative effects on human health. We show that in order to improve air quality, regional policies should be implemented due to the transboundary features of PM pollution. 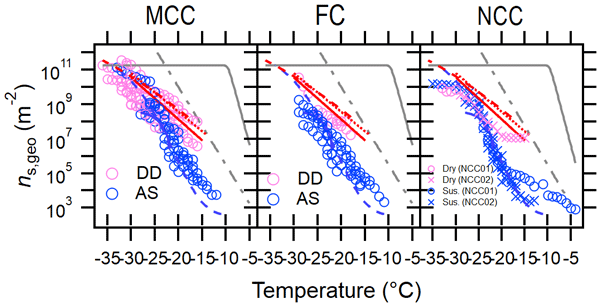 The ice nucleation ability of two natural desert dusts coated with a proxy of secondary organic aerosol is presented for temperatures and relative humidity conditions relevant for mixed-phase clouds. We find that at the tested conditions, there is no effect on the ice nucleation ability of the particles due to the organic coating. Furthermore, the two dust samples do not show variability within measurement uncertainty. Particle size and surface area may play a role in any difference observed. Multilayer clouds are coexisting clouds at different heights. We evaluate measurements and find that Arctic multilayer clouds occur in 29 % of the investigated days at Ny-Ålesund, Svalbard. Multilayer clouds can interact by ice crystals falling from the upper cloud into the lower cloud. This is possible in 23 % of the investigated days, and in 9 % it is not possible. Weather models are still error-prone in the Arctic and we suggest that multilayer clouds should be included more in future work. Northern African mineral dust provides the Amazon Basin with essential nutrients, although the process is still poorly understood. In our study, we utilise high resolution satellite data to analyse northern African dust sources of the 2015–2017 winter dust seasons. We find that the majority of dust is emitted from paleolake and paleoriver systems. Specifically paleorivers have been mostly overlooked to date. We furthermore find that dune fields do not produce much dust. The stratospheric circulation is important for transporting ozone and water vapor, and models of the stratosphere differ. The metrics used to compare models are inconsistent between studies and cannot be calculated from observational data. In this paper, we explore a metric for the circulation that can be calculated from observations and examine how it relates to the more commonly used metrics. We find substantial differences in the upper and lower stratosphere depending on the choice of metric. Isoprene is a highly reactive chemical released to the atmosphere by plants. Its gas-phase reactions and interactions with chemicals released by human activity have far-reaching atmospheric consequences, contributing to ozone and particulate pollution and prolonging the lifetime of methane, a potent greenhouse gas. We use global simulations with a new isoprene reaction scheme to quantify those effects, and to show how recently discovered aspects of isoprene chemistry play out on a global scale. Reactive oxygen species (ROS) are believed to contribute to the adverse health effects of aerosols. We measured particle-bound ROS (PB-ROS) with an on-line instrument in two distinct environments, i.e. Beijing (China) and Bern (Switzerland). In both cities these exogenic ROS are predominantly related to secondary organic aerosol (SOA). PB-ROS content in SOA from various anthropogenic emission sources tested in the laboratory was comparable to that in the ambient measurements. Year-long observations of PM2.5, gaseous pollutants, and meteorological parameters in Beijing were analysed to investigate sulfate formation. RH and O3 concentrations above thresholds of 45 % and 35 ppb, respectively, greatly accelerated sulfate formation. Ambient changes in RH and O3 contributed to variations in sulfate formation among different seasons and pollution levels. A shift from gas phase to multiphase SO2 oxidation contributed to fast sulfate formation under polluted conditions. 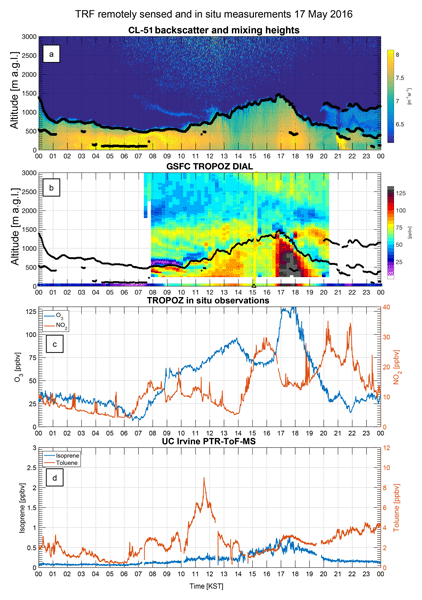 In this study we present a mixing process around the tropopause in extratropical baroclinic waves. We analyze airborne data from a flight during the WISE campaign in autumn 2017 over the North Atlantic. We further use idealized experiments to study the mixing process. Although the process occurs on small geographical scale, it might be of importance due to its relation to a frequent feature of the extratropical UTLS. The process is relevant for STE but is not fully included in climatologies. 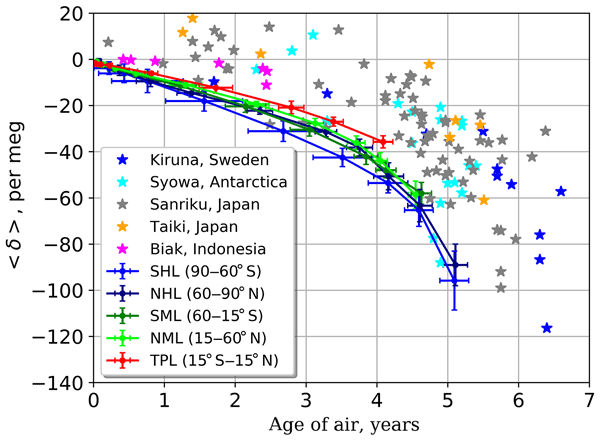 In the East Asian middle and upper troposphere, foreign ozone is 0.5–6 times more than its native counterpart in all the seasons. At the East Asian surface, the annual mean concentrations of foreign ozone and native ozone are comparable, being approximately 20 ppbv. The seasonal and interannual variations of foreign ozone over East Asia are closely related to the East Asian monsoon. The Tropospheric Water Radiometer (TROWARA) observed an enhanced intensity of short-term IWV fluctuations during daytime in summer. These IWV fluctuations are possibly related to thermal convective activity in the lower troposphere. 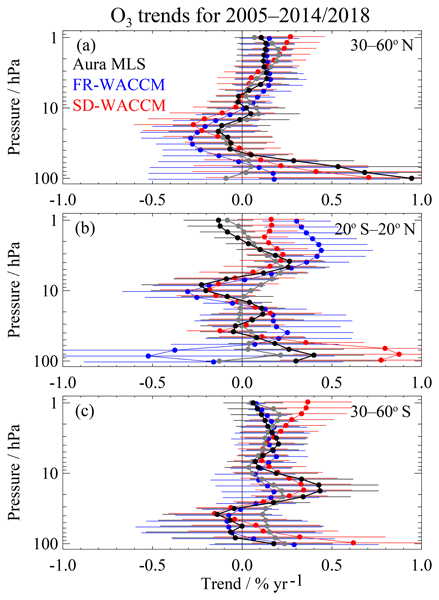 The observed climatology and spectra of IWV fluctuations might be useful for modeling studies of water vapor convection in the atmospheric boundary layer at mid-latitudes. We present a way to rate the CO2 flux estimates made from inversion of a global atmospheric transport model. Our approach relies on accurate aircraft measurements in the free troposphere. It shows that some satellite soundings can now provide inversion results that are, despite their uncertainty, comparable in credibility to traditional inversions using the accurate but sparse surface network and that are therefore complementary for studies of the global carbon budget. Observations of clouds at a mountain-top laboratory revealed for the first time the presence of “voids”, i.e., elongated volumes inside a cloud that are devoid of droplets. Theoretical and numerical analyses suggest that these voids are a result of strong and long-lasting vortex presence in turbulent air. If this is confirmed in further investigation, the effect may become an important part of models describing cloud evolution and rain formation. 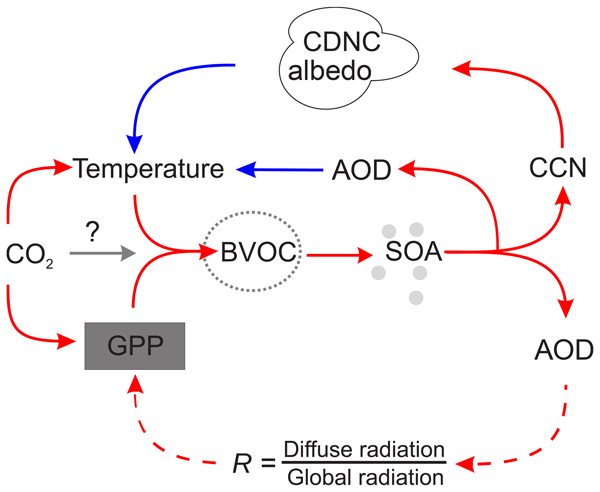 Significant efforts are required to estimate the direct radiative effects of aerosols above clouds (DAREcloudy). 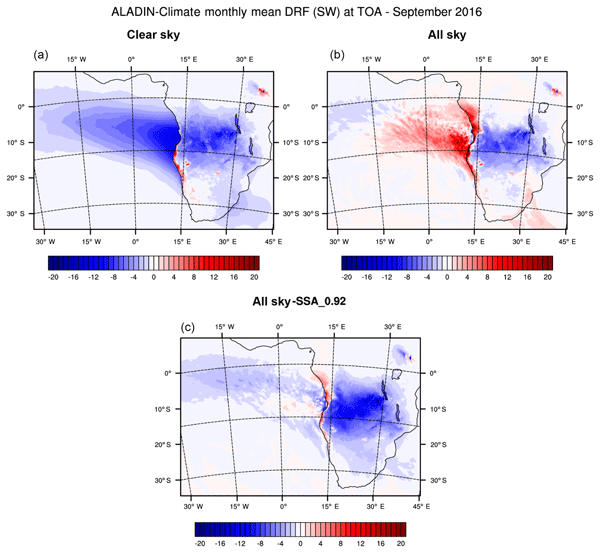 We have used a combination of passive and active A-Train satellite sensors and derive mainly positive global and regional DAREcloudy values (e.g., global seasonal values between 0.13 and 0.26 W m-2). Despite differences in methods and sensors, the DAREcloudy values in this study are generally higher than previously reported. We discuss the primary reasons for these higher estimates. 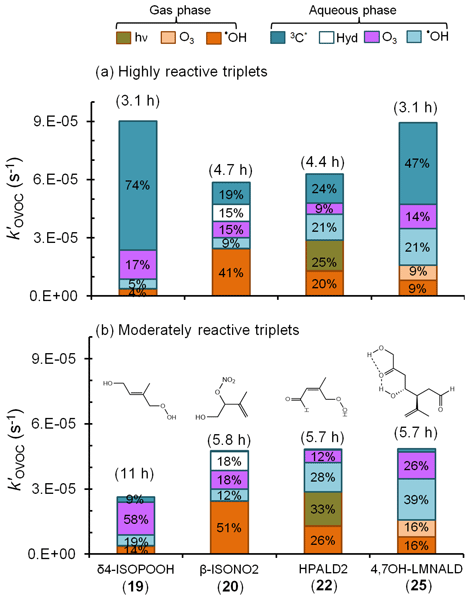 Organic triplets are an important class of aqueous photooxidants, but little is known about their reactions with most atmospheric organic compounds. We measured the reaction rate constants of a model triplet with 17 aliphatic alkenes; using their correlation with oxidation potential, we predicted rate constants for some atmospherically relevant alkenes. Depending on their reactivities, triplets can be minor to important sinks for isoprene- and limonene-derived alkenes in cloud or fog drops. During the May–June 2016 International Cooperative Air Quality Field Study in Korea (KORUS-AQ), pollution reached the remote Taehwa Research Forest (TRF) site. Two case studies are examined and observations clearly identify TRF and the surrounding rural areas as long-term receptor sites for severe urban pollution events. In summary, domestic emissions may be causing more pollution than by transboundary pathways, which have been historically believed to be the major source of air pollution. New particle formation and growth are important processes affecting climate and air quality. A significant fraction of newly formed particles originates from sulfuric acid, water, and ammonia. 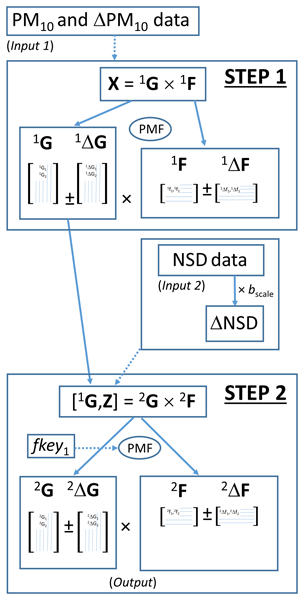 The present study introduces a new process model for the calculation of aerosol nucleation and growth rates for the sulfuric acid–ammonia system. The thermodynamic parameters enabling these calculations are derived from laboratory (CLOUD chamber) measurements. This paper seeks to better our understanding of how dust storms are represented in a weather model. Depending on how well the model can represent the storm, it can change the dust forecast significantly. This is important for predictions of air quality and visibility, and because dust can heat and cool the air in its environment, it is also crucial for calculating the earth’s energy budget. Here, we communicate the uncertainty in a dust model and the effect that may have on dust forecasts. Mineral dusts are a source of ice-nucleating particles (INP) in the atmosphere. Here we present a comprehensive survey of the ice-nucleating ability of naturally occurring quartz. We show the ice-nucleating variability of quartz and its sensitivity to time spent in water and air. We propose four new parameterisations for the minerals quartz, K-feldspar, albite and plagioclase to predict INP concentrations in the atmosphere and show that K-feldspar is the dominant INP type in mineral dusts. This study is the first to report size-resolved PM mass and composition in Metro Manila, Philippines. 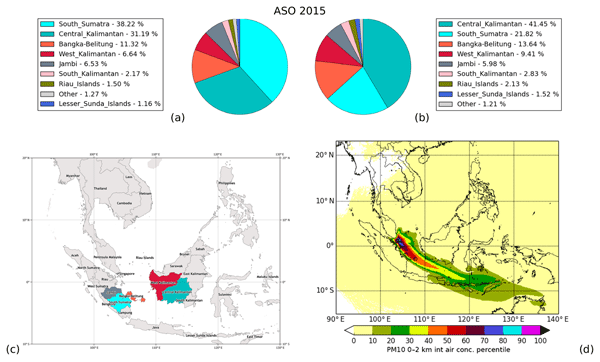 The results, which focus on the southwest monsoon season (SWM), are important with regard to understanding the competition between local sources and long range transport; characterizing the properties of aerosol impacted by both aqueous processing and wet scavenging; and providing contextual data for comparison with other monsoonal regions and coastal megacities. The 2014–2015 Holuhraun eruption was the largest in Iceland for 200 years, emitting huge quantities of gas into the troposphere, at times overwhelming European anthropogenic emissions. Infrared Atmospheric sounding Interferometer data are used to derive the first time series of daily sulfur dioxide mass and vertical distribution over the eruption period. A scheme is used to estimate sulfur dioxide fluxes, the total erupted mass, and how long the sulfur dioxide remains in the atmosphere. 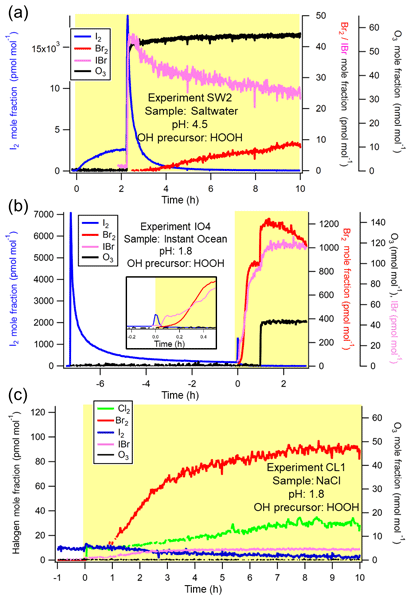 In this study, we found that a chemical called hydroxyl radical can help create chlorine, bromine, and iodine (i.e., halogens) from acidic frozen imitation seawater. Even more halogens are created if we also add ozone. This result helps our understanding of how halogens are released from the frozen Arctic ice and snow into the atmosphere, where they alter the atmosphere's oxidation ability. Airborne particles are a cause of illness and premature death. Cost-effective control of particles in the atmosphere depends upon a reliable knowledge of their sources. This paper proposes and tests a new method for attributing particles quantitatively to the sources responsible for their emission or atmospheric formation. 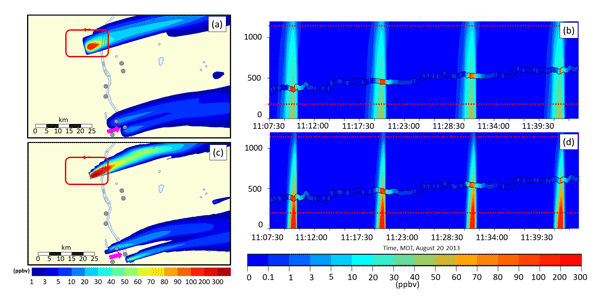 This study is among the first modeling studies on stratospheric sulfate geoengineering that interactively couple a size-resolved sectional aerosol module to well-described stratospheric chemistry and radiation schemes in a global 3-D chemistry–climate model. 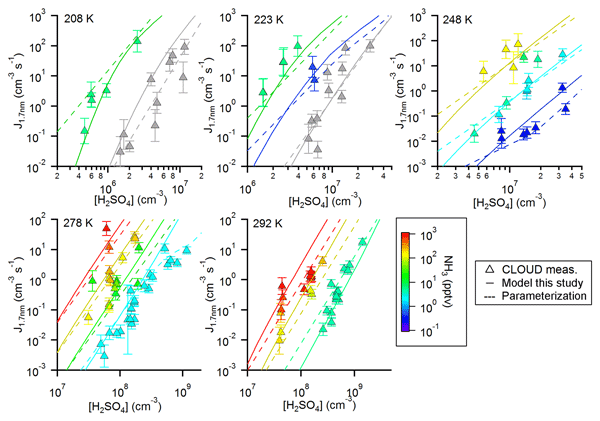 We found that compared with SO2 injection, the direct emission of aerosols results in more effective radiative forcing and that sensitivities to different injection strategies vary for different forms of injected sulfur. This study reports the improvement of air quality in port areas following the implementation of a marine fuel quality regulation. 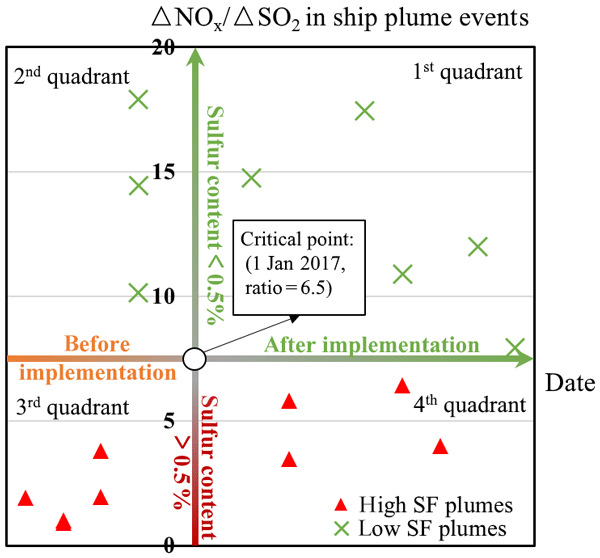 We found that the monitoring of NOx and SO2 concentrations in ship plumes could indicate whether a ship had switched to low-sulphur fuel or not. Results showed that most ships complied with the fuel regulation, which reduced the SO2 emissions by 75 %. After regulation, vanadium, which was used as marker for shipping emissions, decreased significantly (by 97.1 %). 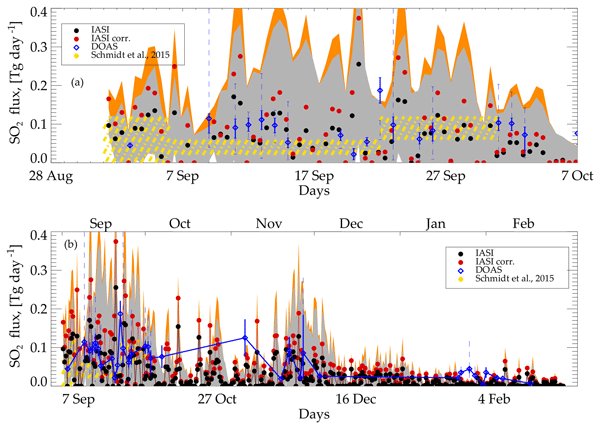 Three aircraft datasets from the DACCIWA campaign in summer 2016 are used here to show there is a background mass of pollution present in the lower atmosphere in southern West Africa. We suggest that this likely comes from biomass burning in central and southern Africa, which has been carried into the region over the Atlantic Ocean. This would have a negative health impact on populations living near the coast and may alter the impact of growing city emissions on cloud formation and the monsoon. Climate model emulators can save computer time but are less accurate than full climate models. We use neural networks to build emulators of precipitation, trained on existing climate model runs. By doing so, we can capture nonlinearities and how the past state of a model (to some degree) shapes the future state. Our emulator outperforms a persistence forecast of precipitation. This work evaluates two versions of a 3-D global model of upper-atmospheric composition for recent decades. The two versions differ mainly in their dynamical (wind) constraints. Model–data differences, variability, and trends in five gases (ozone, H2O, HCl, HNO3, and N2O) are compared. While the match between models and observations is impressive, a few areas of discrepancy are noted. This work also updates trends in composition based on recent satellite-based measurements (through 2018). A total of 20 ice nucleation measurement techniques contributed to investigate the immersion freezing behavior of cellulose particles – natural polymers. Our data showed several types of cellulose are able to nucleate ice as efficiently as some mineral dust samples and cellulose has the potential to be an important atmospheric ice-nucleating particle. Continued investigation/collaboration is necessary to obtain further insight into consistency or diversity of ice nucleation measurements. To understand the contribution of ground emission during heavy pollution in Beijing, Tianjin and Hebei, aerosol fluxes were estimated in Beijing and Gucheng areas. The results show that in the three stages of a heavy pollution process (transport, accumulative and removal stages,TS, AS and RS), the ground emissions in the TS and RS stages are stronger, while the ground discharge in the AS stage is weak. The weakened mass flux indicates that the already weak turbulence would be further weakened. The acid deposition was still an important environmental issue in China. The rainwater samples in 320 cities of China were collected to determine the acidic ion concentrations and identify their spatiotemporal variations and sources. The higher acidic ions showed the higher concentrations in winter. Furthermore, the highest acidic ion concentrations were mainly distributed on YRD and SB. These acidic ions were mainly sourced from industrial emissions and agricultural activities. This study characterizes the changes observed at Paris urban scale, and attempts to identify the surface-atmosphere feedbacks likely to explain the trends observed as a function of the different configurations of large-scale dynamics. This article is interested in several atmospheric parameters and their possible retroactions. Finally, to study urban environments, the analysis at the local scale is essential because very poorly represented in the model. We measure surface activity and cloud-forming potential of pollenkitt, an organic mixture coating pollen grains. Cloud droplet formation is affected through both surface tension and bulk depletion, with a consistent particle size-dependent signature. 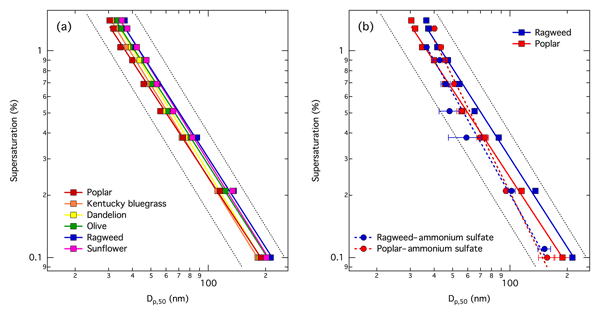 We observe nonideal solution effects in pollenkitt mixtures with ammonium sulfate salt. Our results suggest sensitivity of general water interactions, including cloud formation by pollen and their fragments, to both atmospheric humidity and aging. This paper covers the importance of understanding ozone pollution in California’s southern San Joaquin Valley from the perspective of meteorological conditions that occur overnight. Our main finding is that stronger winds aloft allow ozone to be depleted overnight, leading to less ozone the following day. This finding has the potential to greatly improve ozone forecasts in the San Joaquin Valley. This study is primarily conducted with aircraft observations. Low GEM level indicated that the SCS suffered less anthropogenic influence. There was no significant difference in GEM and HgP2.5 values between day and night, but the RGM level was higher in daytime than in nighttime. The size distribution of HgP in PM10 was observed to be bi-modal, but the coarse modal was the dominant size. The annual emission flux of Hg0 from the SCS was estimated to be 159 tons yr−1. The dry deposition was an important pathway for the input of atmospheric Hg to the SCS. The Paris Agreement set the goal of remaining well below a 2 degree Celsius global temperature rise, but it is unclear how the future emissions from international shipping and aviation will contribute to this threshold. Here we estimate that the sectors’ future emissions of carbon dioxide will contribute a combined 0.15 degrees Celsius by the end of the century should no action be taken, but that proposed mitigation policies have the potential to reduce this warming by almost 90 percent. Low clouds persist in the summer Arctic with important consequences for the radiation budget. We found that the ability of precipitation parameterizations to reproduce observed cloud properties was more variable than their better representation of radiative effects. Our results show that cloud properties and their parameterizations affect the radiative effects of clouds. Wildfires are a large source of gases and particles to the atmosphere, both of which impact human health and climate. The amount and composition of particles from wildfires can change with time in the atmosphere; however, the impact of aging is not well understood. In a series of controlled laboratory experiments, we show that the particles are oxidized and a significant fraction of the gas-phase carbon (24–56 %) is converted to particles over the course of several days in the atmosphere. Ice crystals in clouds have a wide variety of form. But many forms seem inexplicable using the common approach of modeling the normal growth rates of the crystal faces. Instead of using only the normal-growth process, we suggest including lateral-growth processes. With these lateral-growth processes, backed up by new experiments, we give explanations for some of these puzzling forms. The forms include the center droxtal in stellar crystals, scrolls, capped columns, sheath bundles, and trigonals. Unburned and partially burned organic compounds emitted from fossil fuel and biomass combustion can react in the atmosphere in the presence of sunlight to form particles. In this work, we use an air pollution model to examine the influence of these organic compounds released by motor vehicles and fires on fine particle pollution in southern California. 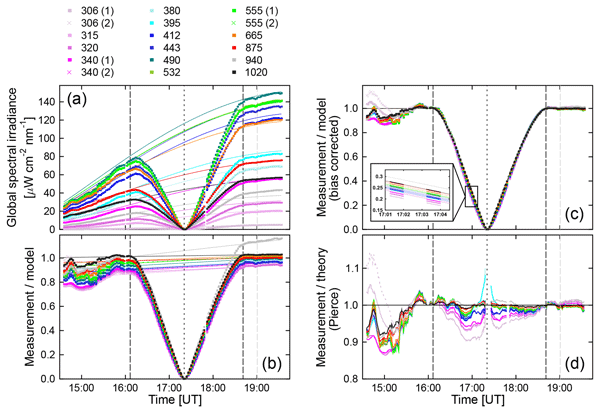 In this paper we present a new description of statistical probability density functions (pdfs) of polar mesospheric clouds (PMC). We derive a new class of pdfs that describes successfully the probability statistic of ALOMAR lidar observations of different ice parameters. 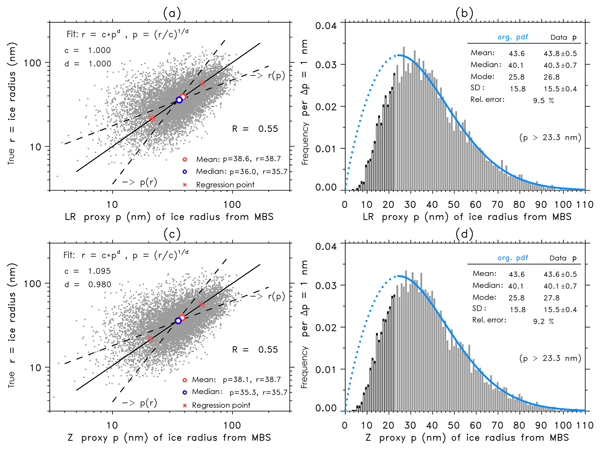 As a main advantage the new method allows us to connect different observational PMC distributions of lidar and satellite data, and also to compare with distributions from ice model studies. Very thin (<10 m) laminations within Arctic clouds have been observed in all seasons using the Canadian Network for the Detection of Atmospheric Change (CANDAC) Rayleigh–Mie–Raman lidar (CRL) at the Polar Environment Atmospheric Research Laboratory (PEARL; Eureka, Nunavut, Canadian High Arctic). The laminations can last longer than 24 h and are often associated with precipitation and atmospheric stability. This has implications for our understanding of cloud internal structure and processes. Thermally driven downslope winds develop in mountainous areas under a weak large-scale forcing and clear skies. In this work, we find that their onset time and intensity are closely connected with both the large-scale wind and soil moisture. We also show how the distinct downslope intensities shape the turbulent and thermal features of the nocturnal atmosphere. The analysis concludes that the downslope–turbulence interaction and the horizontal transport explain the important CO2 variability. The Canadian Arctic has the potential for enhanced methane (CH4) emissions under global warming. However, the regional CH4 emission (fluxes) estimates range widely. This study analyzes recent Canadian Arctic CH4 observations and estimates the regional emissions. The additional observations yield robust CH4 flux estimates and enable the partitioning of the CH4 sources into wetland and forest fires. The results indicate that years with warmer summer conditions result in more wetland CH4 emissions. The future sea-level rise will depend on how much the Antarctic ice sheet gain – via precipitation – or loose mass. The simulation of precipitation by numerical models used for projections depends on the representation of the atmospheric circulation over and around Antarctica. 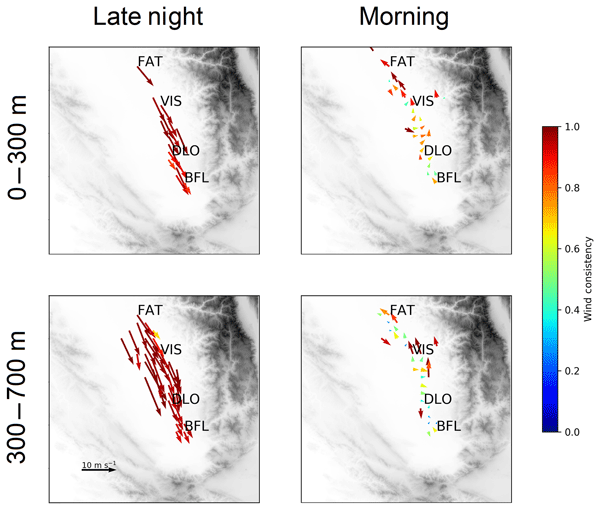 Using daily measurements from balloon soundings at nine Antarctic stations, this study characterizes the structure of the atmosphere over the Antarctic coast and its representation in atmospheric simulations. Isoprene is the most abundantly emitted reactive organic gas globally, thus it is important to understand its fate and role in aerosol formation and growth. A major product of its oxidation is an epoxy diol, IEPOX, which can be efficiently taken up by acidic aerosol to generate substantial amounts of secondary organic aerosol (SOA). We present chamber experiments exploring the properties of the IEPOX SOA and reconcile discrepancies between field, laboratory, and model studies of this process. An eastward advection of dry and warm air in spring was identified as a major drought onset mechanism over the US Great Plains (GP). 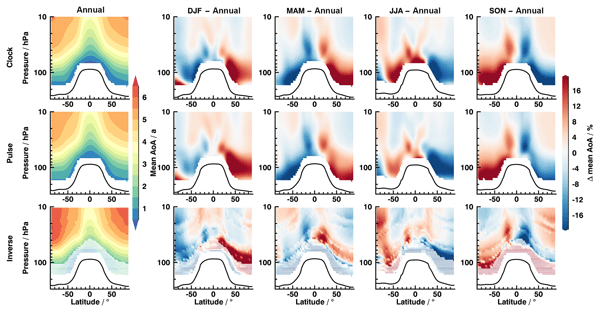 Further breakdown of the zonal advection into the dynamic versus thermodynamic contributions revealed dominance of the latter in the tropospheric drying observed during the onset of GP 2011 and 2012 droughts. The dependence of thermodynamic advection on moisture gradient links the spring precipitation in the Rockies and US southwest to the GP summer precipitation. The climatology of the Brewer–Dobson circulation and the potential contribution of gravity waves (GWs) are examined using four modern reanalysis datasets for the annual mean and each season. In this study, unresolved waves are designated as GWs. GWs are essential to determine the high-latitude extension and the turn-around latitude except in summer, although their contribution to the upward mass flux is relatively small. Plausible deficiencies of the current GW parameterizations are discussed. In this study, we find that land surface changes via urbanization have caused reductions (increases) in air temperature and ventilation during the day (night) in Southern California. 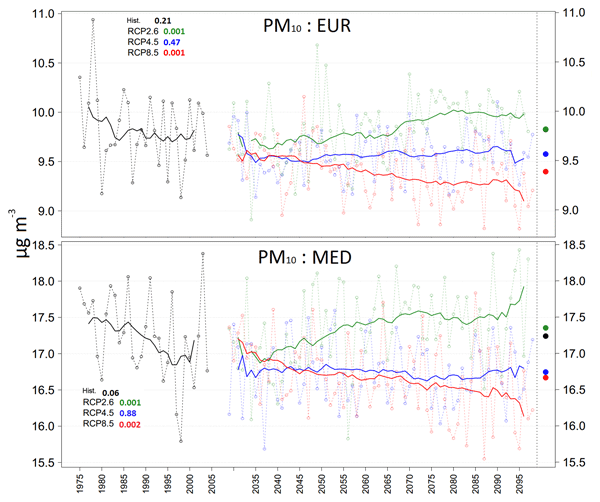 Changes in meteorology have consequently caused (a) increases in PM2.5 during the day, vice versa at night, and (b) increases in O3 for most times of day. These results suggest that all environmental systems should be taken into account when studying the influence of policies that impact the land surface in cities. 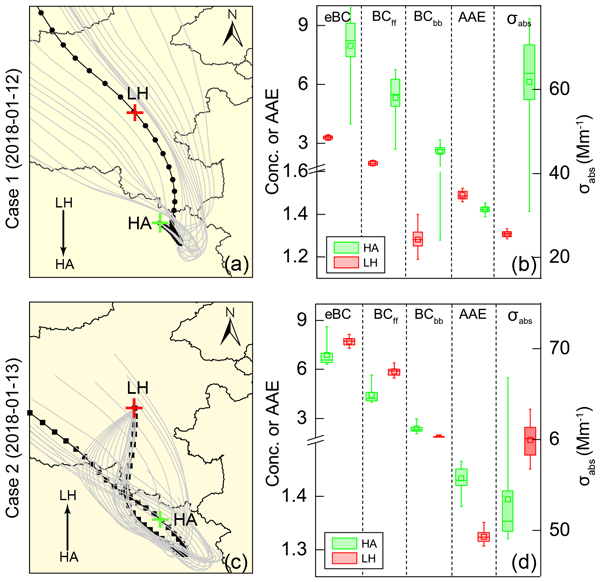 This study simultaneously observed black carbon (BC) at five sites in central China and on the south edge of North China Plain, which have the most serious air pollution issues in China. The differences in BC properties between different air quality conditions and the property changes during transportation were studied. The main findings of this study were that during the downwind transportation of air, the BC mass concentration increased, whereas the absorption Ångström exponent decreased. Atmospheric transport models are increasingly being used to estimate CO2 emissions from atmospheric CO2 measurements. 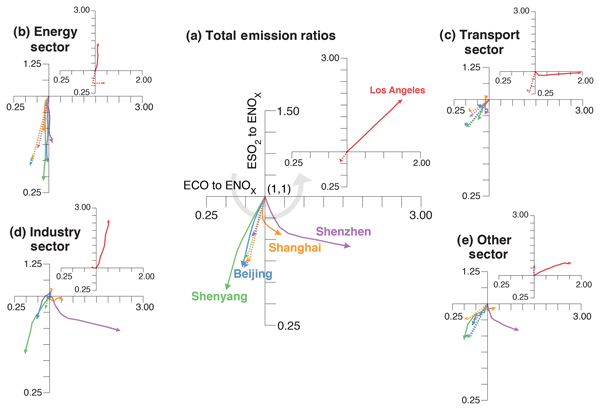 This study demonstrates the importance of distributing CO2 emissions vertically in the model according to realistic profiles, since a major proportion of CO2 is emitted through tall stacks from power plants and industrial sources. With the traditional approach of emitting all CO2 at the surface, models may significantly overestimate the atmospheric CO2 levels. 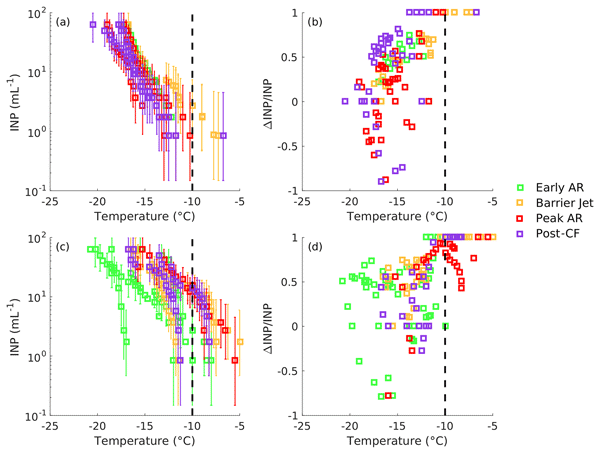 In this paper we explore the connection between changes in surface temperature and changes in ozone pollution. While explanations for this connection have been proposed in the past, we attempt to better quantify and compare them using models and statistics. We find that several of the most commonly cited mechanisms, including emissions from plants, and chemical processes, can explain less than half of the correlation. Other weather effects are identified as the most likely driver for the rest. 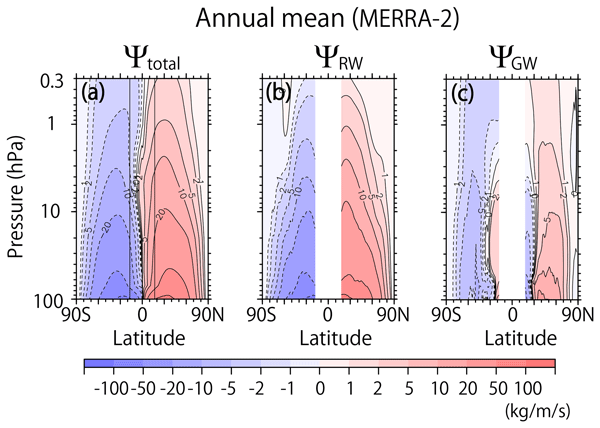 We evaluate clouds over the Southern Ocean in the climate model HadGEM3 and reanalysis MERRA-2 using ship-based ceilometer and radiosonde observations. We find the models underestimate cloud cover by 18–25 %, with clouds below 2 km dominant in reality, but lacking in the models. 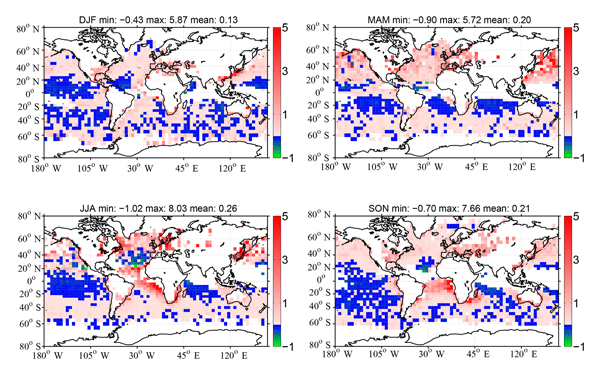 We find a strong link between clouds, atmospheric stability and sea surface temperature in observations, but not in the models, implicating subgrid processes do not generate enough cloud in response to these conditions. Our multi-year observational study regarding Organic Aerosol (OA) in Po Valley, indicates that more than half of the OA is of secondary origin (SOA) through all the year and at both urban and rural sites. 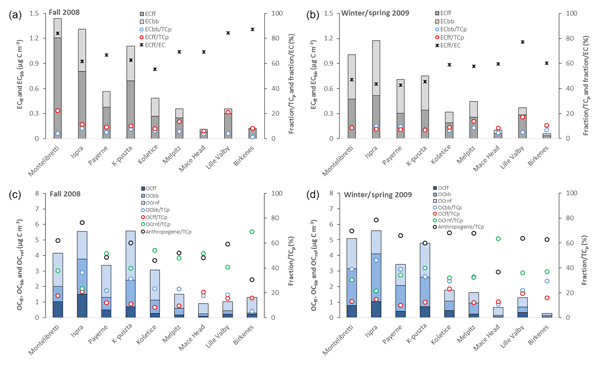 Within the SOA, the measurements show the importance of biomass burning (BB) aging products during cold seasons and indicate aqueous-phase processing of BB emissions as a fundamental driver of SOA formation in wintertime with important consequences on air quality policy also at the global level. Understanding carbon dioxide (CO2) fluxes from the terrestrial biosphere on a national scale is important for evaluating land use strategies to mitigate climate change. We estimate emissions of CO2 from the UK biosphere using atmospheric data in a top-down approach. Our findings show that bottom-up estimates from models of biospheric fluxes overestimate the amount of CO2 uptake in summer. This suggests these models wrongly estimate or omit key processes, e.g. land disturbance due to harvest. In situ microphysical measurements collected during 23 fog events at SIRTA (south of Paris) are examined here. An original iterative method based on the κ-Köhler theory has been used to compute statistics of their activation properties. Useful information is provided to constrain and validate numerical simulations. 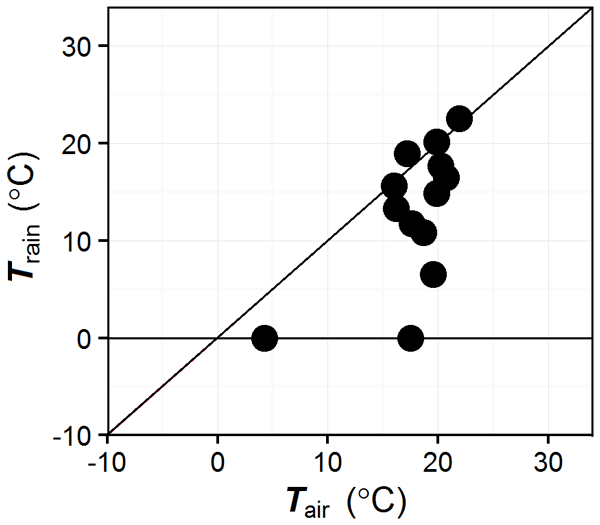 The paper demonstrates that supersaturation encountered in these fogs is too low to observe a correlation between concentrations of aerosols > 200 nm and droplet concentrations. High-resolution air-quality forecast modeling results are compared for two different grid spacings for the Environment and Climate Change Canada GEM-MACH model. 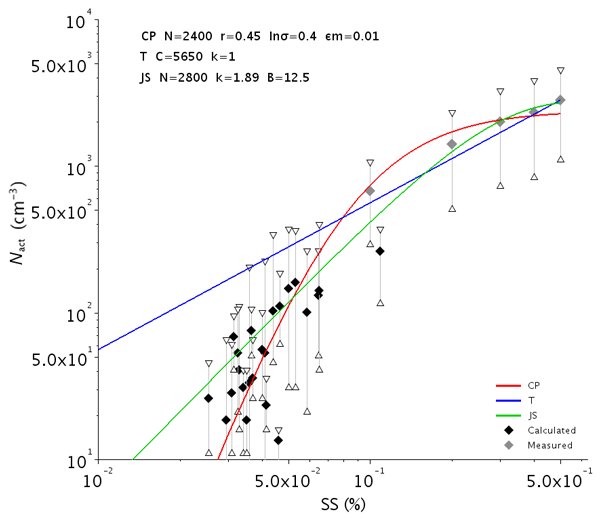 While the higher-resolution simulations have worse formal error scores, we show that the higher-resolution model nevertheless has the ability to better resolve plume maxima and has better performance when the evaluation occurs using new scoring metrics which operate on an equal-representative-area basis. 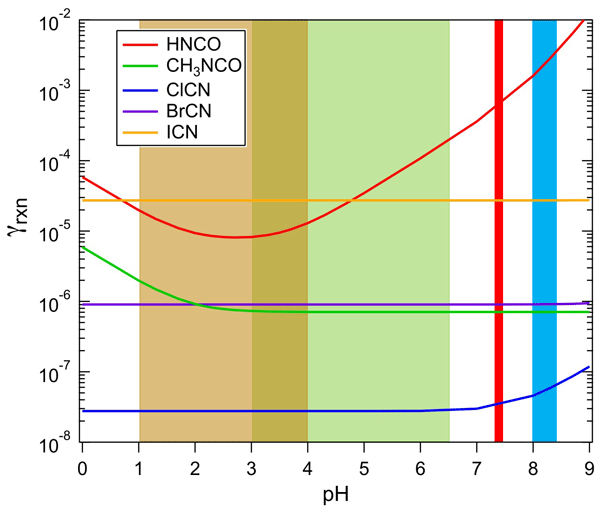 Condensed-phase reactions are important removal processes for reduced nitrogen species, isocyanic acid (HNCO), methyl isocyanate (CH3NCO), and cyanogen halides (XCN, X = Cl, Br, I). 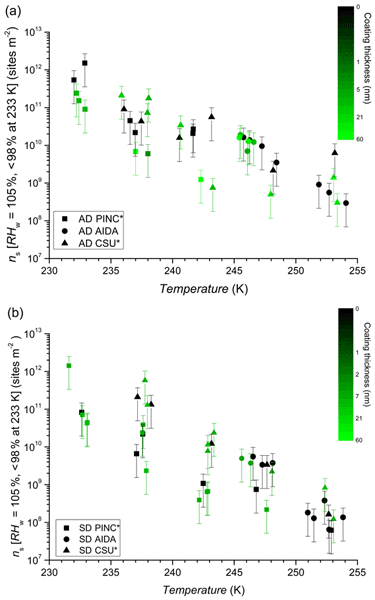 This chemistry is not well understood, so we measured aqueous-phase solubilities and reaction rates under a range of temperatures and conditions and in n-octanol, a proxy for non-polar media and biological membranes. The results were used to estimate atmospheric removal rates and fates of these nitrogen compounds. 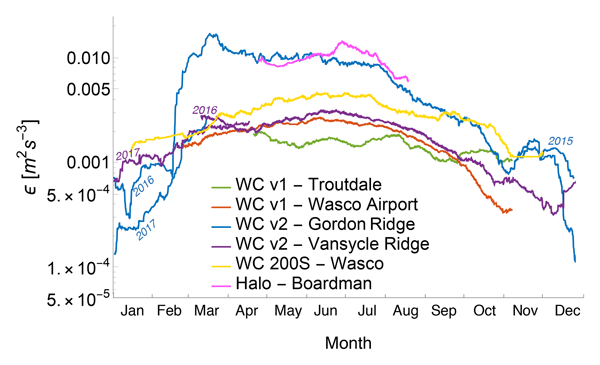 To improve the parameterization of the turbulence dissipation rate (ε) in numerical weather prediction models, we have assessed its temporal and spatial variability at various scales in the Columbia River Gorge during the WFIP2 field experiment. The turbulence dissipation rate shows large spatial variability, even at the microscale, with larger values in sites located downwind of complex orographic structures or in wind farm wakes. 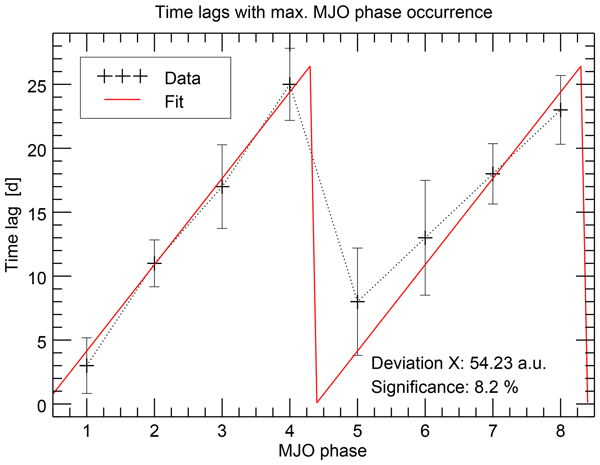 Distinct diurnal and seasonal cycles in ε have also been found. Fog and low clouds (FLCs) are an essential but poorly understood component of Namib-region climate. This study uses observations from multiple satellite platforms and ground-based measurements to coherently characterize Namib-region FLC patterns. Findings concerning the seasonal cycle of the vertical structure and the diurnal cycle of FLCs lead to a new conceptual model of the spatiotemporal dynamics of FLCs in the Namib and help to improve the understanding of underlying processes. Biomass burning is one of the largest sources of atmospheric pollutants worldwide. 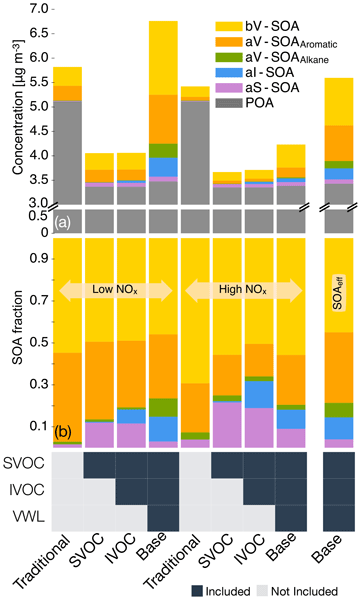 This paper presents an up-to-date compilation of emission factors for over 120 trace gas and aerosol species from the different forms of open vegetation fires and domestic biofuel use, based on an analysis over 350 published studies. 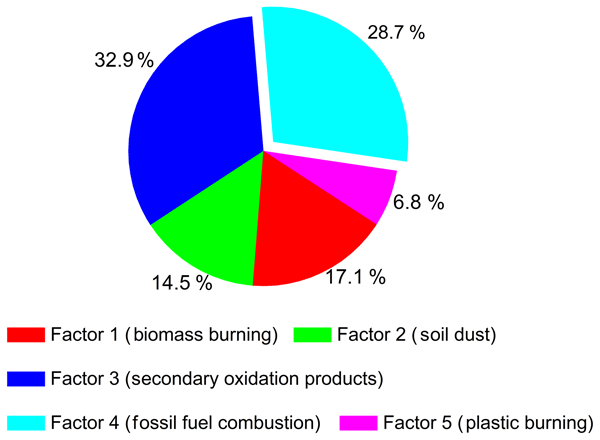 Using these emission factors and current global burning activity data, the annual emissions of important species released by the various types of biomass burning are estimated. During 2006–2015, emissions of SO2, NOx, PM2.5 and PM10 saw obvious downtrend. However, most emissions still have large reduction potential. Control measures on vehicles should be largely enhanced to reverse the growing emission trends due to the increase of vehicles population. Also controls measures on VOC and NH3 should be heighted since they still increased in 2006–2015. Since most control measures focused on PRD rather than non-PRD in GD, emissions in non-PRD were increasingly important. 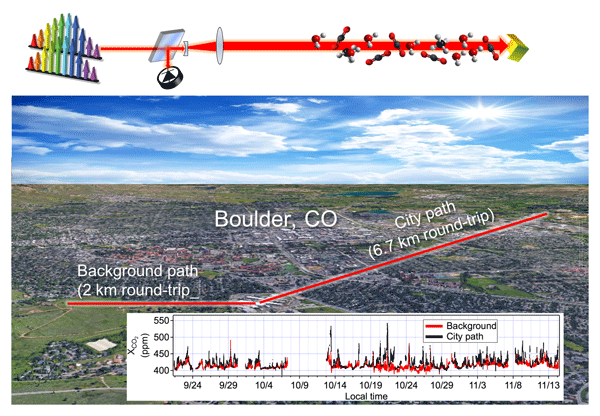 In this work we measure carbon dioxide for the city of Boulder, Colorado, using a novel laser-based instrument. We then use a model to determine the strength of the emissions from the city. Based on our measurement location, we attribute the majority of these emissions to vehicles. We compare our emissions to the city vehicle emissions inventory with good agreement. To better understand the characteristics of air pollutants and their interactions in the highly polluted region of eastern China, continuous measurements of particles and trace gases were made during cold seasons in 2016. We found 48 days with excess of PM2.5, 14 with excess of PM10, and 40 with excess of O3. Results further reveal the formation of secondary aerosols under high-O3 and temperature conditions and suggest a VOC-sensitive regime for photochemical production of O3 in urban Nanjing. As frozen soil, called permafrost, increasingly thaws over the years, scientists have put much effort into understanding how this may increase carbon emissions, which would exacerbate climate change. Our work supports the emerging view that these efforts should also include nitrous oxide (N2O), a more potent greenhouse gas. 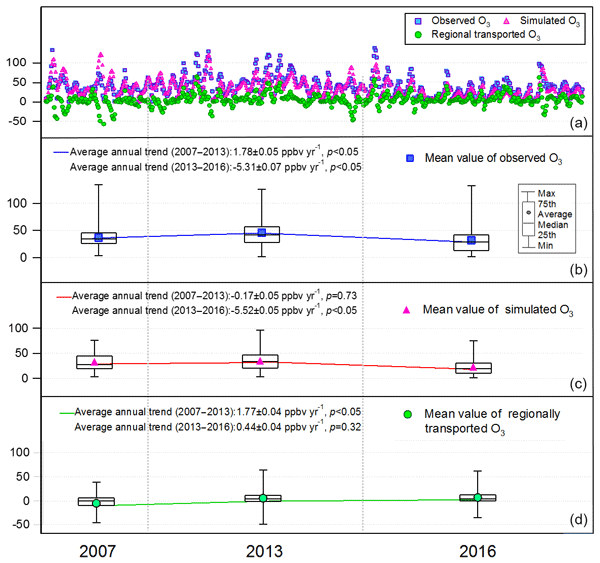 Using a low-flying aircraft to study thousands of acres of Alaskan permafrost, we observed average N2O emissions higher than typically assumed for regions such as this. We examine a possible statistical linkage between atmospheric variability in the tropical troposphere on the intraseasonal timescale, which is known as Madden–Julian oscillation, and known variability of the solar radiation with a period of 27 days. This helps to understand tropospheric variability in more detail, which is generally of interest, e.g., for weather forecasting. We find indications for such a linkage; however, more research has to be conducted for an unambiguous attribution. Polar mesospheric clouds (PMC) are water ice clouds forming on nanoparticles in the polar summer mesopause. 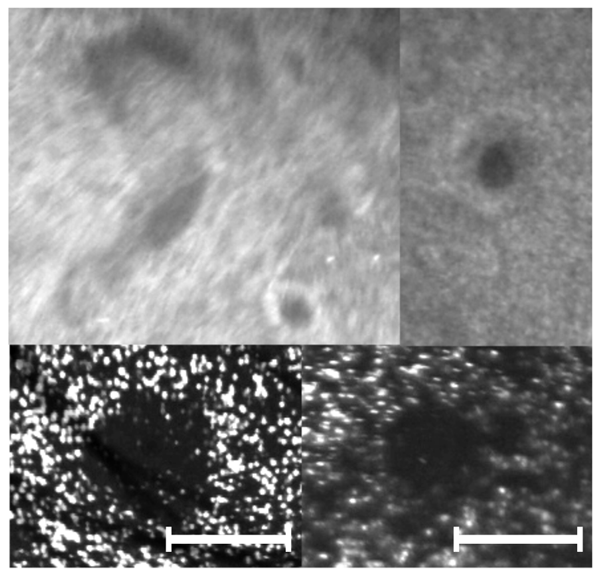 We investigate the impact of solar radiation on PMC formation in the laboratory. 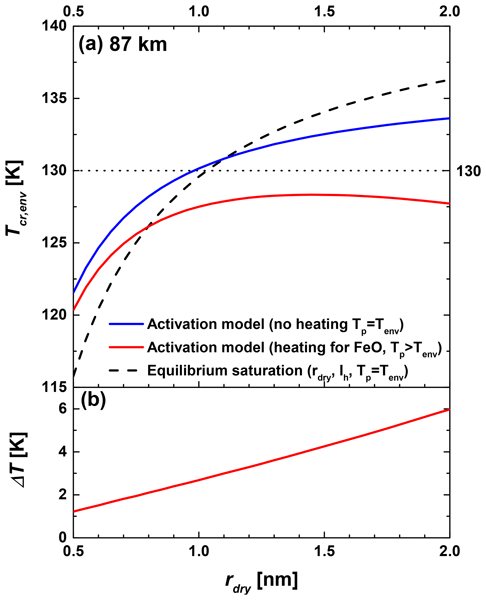 We show that Mie theory calculations combined with an equilibrium temperature model presented in this work predict the warming of the particles very well. Using this model we demonstrate that the impact of solar radiation on ice particle formation is significantly lower than previously assumed. 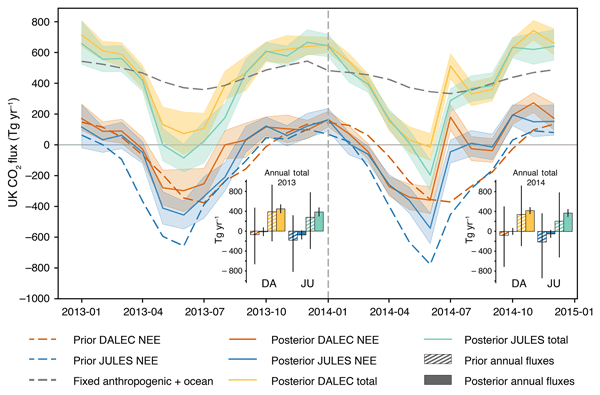 After severe ozone depletion, upper stratospheric ozone has started to recover in recent years. However, stratospheric ozone trends from various data sets still show differences. To partly explain such differences, we investigate how the trends are affected by different factors, for example, anomalies in the data. 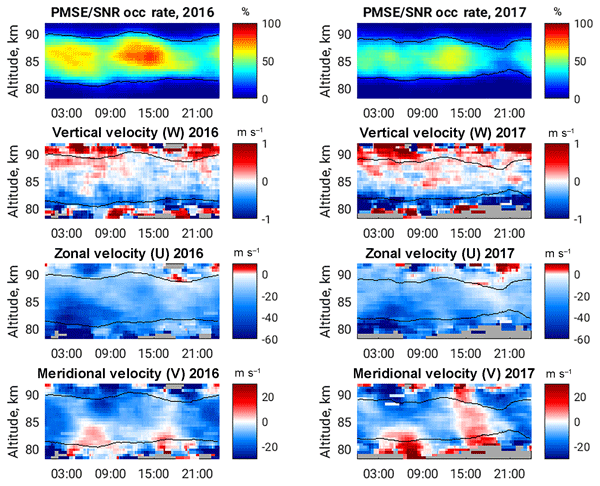 We show how trend estimates can be improved by considering such anomalies and present updated stratospheric ozone trends from ground data measured in central Europe.